Here at Inspect My Gadget, we have already shown you how to make shortcuts to change screen resolutions. 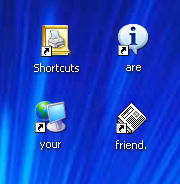 Shortcuts are a very quick and efficient method to launch programs. We can take this much further and use shortcuts to perform a whole range of supposedly simple tasks. The easiest way to set this up is to copy the program to the root of your C:, right click on the program and create a shortcut. You can then edit the shortcut with the necessary arguments. Check out the NirSoft website to find the arguments to achieve your desired task. The formatting is similar to most other programs that allow for arguments. An example is below. While shortcuts are a quick way to achieve any of these tasks, you could also use NirCmd in batch files. It would be a good way to set the volume of a music player on launch, or to disable the screensaver while watching a movie. NirCmd may just spare you from that one niggling task, where you have had to go through various menus to get it to happen in the past. NirCmd is available for free from NirSoft.